To use the feature, open Google Maps and tap "Restaurants" on the Explore tab. Then long press on any location to add it to a shortlist, shown in a small floating bubble on the lower right side of the screen. Once you add a few places you can share the shortlist with friends through any messaging app, like iMessages, which will then let them browse the list and link them back to Google Maps. 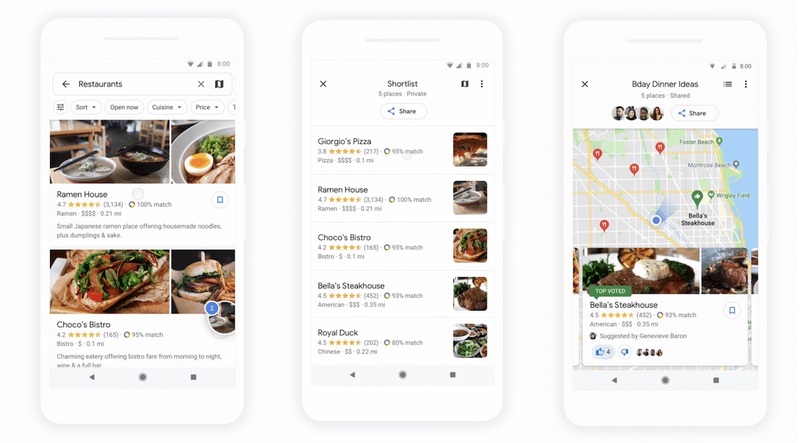 Friends can then vote in Google Maps on their favorite restaurant in the shortlist, and every member in the group can add and delete places. Voting results are showed in Google Maps, and if a group member doesn't have the app they can also view it on the web. At Google I/O in May, Google outlined numerous features coming to Google Maps throughout the year, including AR Street View, a "For You" Tab, and this week's group planning feature. Recently, Google Maps on iOS also updated with an events section and elevation data, and introduced CarPlay support in iOS 12. That Google thinks you need a voting system to decide on a restaurant with friends shows once again that they don’t understand what it’s like to be normal humans. Unfortunately you'd be surprised. My friends are so bad about deciding where to eat I made an app that picks for us. When I start the app there's a 20 second countdown, if they don't decide by then the app picks a place and they have to deal with it. Because texting your friends for suggestions on where to eat is too difficult nowadays? I'm sorry, but I'll probably never use this feature. For some it can be a similar type of improvement that texting brought for this kind of thing over calling, for example.